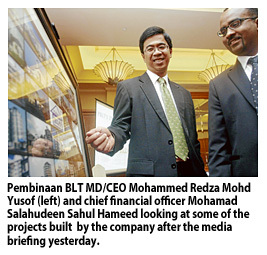 PEMBINAAN BLT Sdn Bhd, a property developer owned by the Ministry of Finance, expects the issuance of its third series of Islamic bonds to be well received by the investment community. "We expect great demand for our sukuk. We expect the rates to be even better than the second series. It (the rates) has been showing downward trend, which is good. "I think we are also hitting the market at the right time. The market has a lot of interest in high-grade papers this time around, but there are not many (such papers) at the moment," managing director and chief executive officer Mohammed Redza Mohd Yusof told newsmen after announcing the third series of Islamic Medium Term Notes (IMTN) yesterday. The fund-raising exercise was part of Pembinaan BLT's 25-year IMTN programme of up to RM10 billion, to be raised by its wholly-owned unit, Aman Sukuk Bhd. The first series of the sukuk issue, which involved RM1.1 billion, was priced between 3.73 per cent (three years) and 5.05 per cent (15 years). The second series, which involved RM1.16 billion, was priced between 3.6 per cent (three years) and 4.45 per cent (15 years). The company has 74 projects in hand worth RM7.6 billion. It expects to complete all the projects by 2015. "So far, we have completed 47 projects worth RM4.28 billion and another 27 projects ongoing," he said. Pembinaan BLT was formed in 2000 to build quarters and facilities for the Royal Malaysia Police. Under its business model, it is responsible to build and secure its own financing. The government will pay Pembinaan BLT in stages only upon completion of the quarters and facilities. The company hopes to secure more jobs over the near term. "We remain very optimistic. We have already received in black and white and are currently ironing out some details. There are many more police facilities to be developed all over the country. "We are looking at RM600 million to RM700 million of jobs, comprising 10 to 15 projects," Mohammed Redza said.